From the early 1980s, the Malvern Shop stood at the corner of Beeston Road and Malvern Road. It closed in early 2018, but happily, Leeds City Council soon let the unit to a new business: an Ethiopian cafe and restaurant, Melkam Café & Restaurant. South Leeds Life went round to try out the food and meet the owner Asagadech Gorfe and her husband Negussie. While Asagadech was busy whipping up our dinner, Negussie answered our questions. SLL: So what led you to set up an Ethiopian restaurant in Leeds? 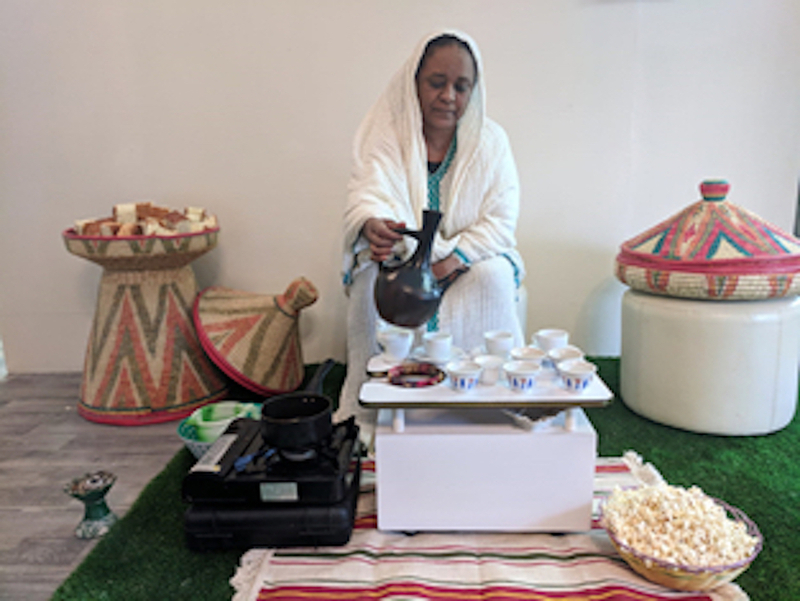 Negussie: We’re originally from Ethiopia, but we came to Leeds from Nairobi in late 2012, through the United Nations refugee agency resettlement scheme. We saw that at that time, there was no Ethiopian restaurant in Yorkshire. Even though we are skilled and had a good business opportunity, it was hard to get the capital and advice we needed. We made a lot of research and took a lot of risks, with a lot of effort. Eventually friends in Kenya lent us money, and in 2015 we were able to open Melkam. SLL: But you’ve only just come to Beeston? Negussie: Originally we opened on Roundhay Road, to be near the Ethiopian community in Harehills and Lincoln Green. Now we have built up a group of loyal customers who appreciate our superior product, as well as lots of demand for our catering services. We realised we could have better premises here and keep our old customers while also reaching new ones, and help Ethiopian communities and other communities in Leeds integrate with each other. This is a Council property: it’s here to serve the community, and that’s what we want to do. When we opened on Roundhay Road, we were in a place that people found unsafe. We brought visitors and business there, and made it secure. Some people say that Beeston is also unsafe, but we can bring people together and give them a place to meet, exchange ideas, enjoy Ethiopian Cuisine, and again we will help make the place secure. We’re grateful to Brendan Mannion at Leeds City Council commercial property letting for the encouragement and support he gave us. Asagadeh brings out the food and we learn more about Ethiopian cuisine. The signature dish at Melkam is mesto. Mesto is based on the fermented Ethiopian flatbread injera, which is made from teff, a cereal that’s a staple in Ethiopia and Eritrea but hard to come by elsewhere. Along with the bread comes a mutton or beef stew and home-made cottage cheese. For vegetarians and vegans, the bread comes with shiro, which is made of chick-peas that have been dried, roasted, crushed, and milled with a special spice mix called berbere. The fermentation of the bread gives it a moreish, sour taste, and the spicing of the stew is lovely. Negussie: Some places use substitutes for these ingredients, but we import them directly. People come to us because we are making real Ethiopian food. Injera is naturally gluten-free, and we also have many vegan customers. And our meals only cost about £8! SLL: And why does your sign also say ‘Ethiopian Coffee Centre’? Negussie: You know that coffee is grown and first founded in Ethiopia? Ethiopian coffee is the best coffee in the world! As Rian Aditia says, “There’s nothing sweeter than a cup of bitter coffee.” From this year, we will be importing green coffee beans, and setting up our own micro-roaster. Our coffee we are sourcing direct from farmers, not from the markets: people will be able to buy our coffee knowing exactly where it has come from. People can also buy berbere and shiro from the cafe too. SLL: What are your opening hours? Negussie: At the moment, 11am-6pm, Monday to Saturday. We can open in the evening if people book in advance: we have a lot of bookings this week! We have just finished decorating the premises, and in January we will begin to expand our hours. People can also order food to take away online or by phone. We hastily ask Negussie the Amharic for ‘thank you’. It turns out to be ‘amesegenalehu’, which is a bit of a mouthful, but we do our best.